Calling all bird lovers! Save on Kaylor Of Colorado Bird Seed at Noah’s Pets and Wild Bird in Bentonville, Arkansas. 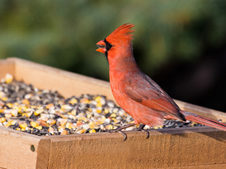 This week only, save on select varieties of Kaylor Of Colorado Bird Seed. Supplies are limited, so hurry in. Savings valid through April 14th. Kaylor of Colorado Wild Bird Seed – Premium bird food made in Greeley, Colorado from locally sourced ingredients. Contains NATURAL seeds, fruits, vegetables, and nuts. Made with natural ingredients that birds search for in nature. Contains no processed pellets or artificial coloring. New to feeding wild birds? Read our proven tips and techniques to help you quickly enjoy beautiful wild birds found around your yard. Most bird feeders are designed to attract a wide variety of wild bird species but some have features which appeal to certain species such as Goldfinches and woodpeckers. An excellent feeder design to start with is a “hopper” feeder with wide ledges which presents black-oil sunflower seeds for big and small birds already living around your backyard. This approach ensures that you will attract beautiful wild birds quickly by using the seeds they prefer. Stop by your local Noah’s Pet and Wild Bird for Kaylor of Colorado seed mixes, assorted bird treats, and bird feeders. Sale valid through April 14, 2018, at Noah’s Pet and Wild Bird in Bentonville, Arkansas. This entry was posted on Monday, April 9th, 2018 at 4:32 pm	and is filed under Bird, Events, News & Updates. You can follow any responses to this entry through the RSS 2.0 feed. Both comments and pings are currently closed.